In recent times – with the wind industry taking a belting around the planet – its spruikers have taken to clinging to any vestige of hope, with the anxious zeal of shipwreck survivors happening upon a little fortuitous flotsam. One such “hope”, is their belief that China provides the perfect example of what wind power outfits can do when immune from the pesky obstacles thrown up by ol’ chestnuts, like free power markets and democratic rights, say. The line is spun that China is leading the world in the roll-out of these things; and is well on the way to a 100% wind powered future. the whole scam depends (apart from suitably benevolent breezes) on the continued willingness of governments to force (through mandated subsidies and/or fines) grid operators or retailers to take power at exorbitant cost, from an entirely weather dependent generation source, that has no commercial value – apart from pocketing subsidies or avoiding fines. And, just like everywhere else, there’s a natural limit to what those bound to pick up the phenomenal costs of endless, corporate welfare on steroids will tolerate – the Chinese, no exception. Here’s a story from wind power barrackers, Bloomberg on the inevitable consequence for wind power outfits when the subsidy stream is delayed, or threatened with decline or demise. China’s wind and solar developers are getting much less than they anticipated in handouts from the government because of a quirk in subsidy policies, threatening to stymie growth in the world’s biggest market for clean energy. The issue relates to the support China pays power suppliers as enticement to develop clean energy projects. Surcharges slapped onto electricity bills to fund the subsidies are too low, leaving a gap between what was promised and what’s being paid out, said Meng Xiangan, vice chairman of the China Renewable Energy Society, an industry group. Left to continue, the trend may foreshadow a reckoning for what has become the engine of growth in the global renewables industry. While China’s hunger for energy is un-sated, less money flowing to developers could ultimately constrain China’s capacity to generate power from nonpolluting sources. “This will weaken enthusiasm for investment and go against the development of renewable power in the long run,” Meng said. Additional delays could ultimately eat into cash flow at companies such as China Longyuan Power Group Corp., China Datang Corporation Renewable Power Co. and others. About 30 billion yuan ($4.7 billion) to 40 billion yuan may be owed by the government to developers in unpaid subsidies, said Li Junfeng, director general of the National Center for Climate Change Strategy and International Cooperation. Some developers have been waiting since before 2012 for payments they’ve yet to receive, Li estimates. A fax sent to the Ministry of Finance, which retains responsible for allocating the subsidies, wasn’t answered. In the U.S., state and federal incentives have been used to help cover the cost of renewable energy projects, mostly in the form of production and investment tax credits. China by contrast supports renewables mainly in through government-set pricing. Since 2006, China has levied a surcharge on consumers to fund the subsidies. The surcharge is currently 0.015 yuan a kilowatt-hour paid for by users, excluding residential and agricultural customers. The Finance Ministry took control of the subsidy program in 2012 from the National Development and Reform Commission, China’s top economic planning agency. But the transition left unclear which agency was responsible for paying any previous shortfall between the subsidies promised and the money raised from the surcharge. 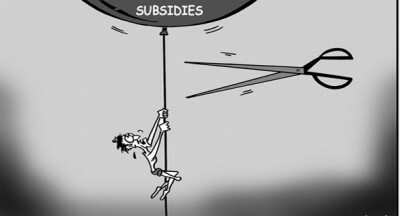 Besides the mismatch between incentive levels and the surcharges, the move to a new subsidy-allocation system in 2012 and complicated application procedures may also be to blame for holding up payments, said Meng at the Renewable Energy Society. The issue is of particular importance at the moment because of the huge amounts of money pouring into the sector in China — and the country’s outsized ambitions. Clean energy investment in China totaled almost $28 billion in the second quarter this year, up 15 percent from a year ago and more than double investment in the U.S., according to data compiled by Bloomberg New Energy Finance. Policymakers want the boom to continue. China added about 17 gigawatts of solar and wind power in the first half alone, data from the country’s National Energy Administration showed last month. The nation vows by 2030 to get 20 percent of its energy from renewables and nuclear power, almost double the current share. Though improving in recent months, Longyuan had about 2 billion yuan in subsidy receivables at the end of 2014, mainly from overdue payments in 2011 or earlier, said Lan Peizhen, Longyuan’s investor relations manager. Payments are now being settled one to two months after the end of the period in which they’re due, she added. Longyuan, China’s biggest wind-farm developer, reported net income of 2.56 billion yuan last year. Datang, an operator of wind and solar plants, had about 2 billion yuan of subsidy receivables as of June, according to an official from Datang Renewables’s investor relations department, who asked not to be identified in line with policy. Companies faced with more delays may need to turn to alternative financing, the Datang official said. At the end of June, the government owed more than 10 billion yuan to operators of Chinese solar farms, according to data from the China Photovoltaic Industry Association. The issue could undermine efforts by China’s renewables developers to raise financing from outside China, said Nick Duan, a Beijing-based analyst from Bloomberg New Energy Finance. Moreover, the overdue subsidies may sour investors on China’s renewables developers, said Karl Liu, a Hong Kong-based analyst from Bank of China International Ltd. The Chinese Renewable Energy Industries Association, an organization that acts as a conduit between government policy makers and industry executives, has called for raising the surcharge to 0.025 yuan a kilowatt-hour, according to Tang Wenqian, executive vice secretary-general. “There’s an impact on the entire supply chain” when subsidies aren’t paid on time, Tang said. An ‘unsustainable rort’ – in anyone’s language. 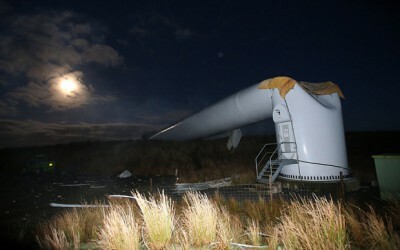 « Big ‘Green’ Wrecking Machines: The Wind Industry’s Woeful ‘Legacy’ – So Far .. Went to bed all good. Had a good night’s sleep until early hours. I was woken up with my head ready to explode. I lay there for about 20 minutes couldn’t get back to sleep, then needles through each ear for approximately 30 seconds and then went back to same as before. Yep, they have started up again. Up at 7 am and sure enough all turning. Easterly wind came up through the night. Just another night with wind turbine torture. Why the spike, it’s when 2 or more turbines get into synchronization and the amplitude increase enormously. Not the frequency. Happens all the time. As for me after a torturous past few nights the wind finally stopped today and what a surprise, so did the turbines, sort of tell a lie as each turbine was spun up one by one through out the day by guess what. Coal fired power, and now tonight I can do something I normally cannot do when the wind is blowing , I can look forward to going to bed and having a good night’s sleep.